University of Lynchburg will host its first Community Strings Concert in Snidow Chapel at 7:30 p.m. on Thursday, October 19. Joe Nigro, professor of violin and viola and artist-in-residence at Lynchburg, will orchestrate the performance. The concert will include several classic pieces, such as Mozart’s Divertimento K.138 and selections from Benjamin Britten’s Simple Symphony. 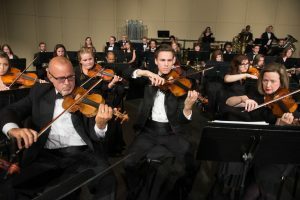 The strings group has been preparing for this concert since University of Lynchburg held a music camp over the summer for students and community members. Cass said, “I would say that we’ve flourished under Joe’s guidance and he allows us to create music with him instead of just playing music,” and Cass also has enjoyed “the sense of community you feel” at practices. Nigro also is artistic director of the James Chamber Players. He formed the James String Quartet in 1995 and the James Chamber Players in 2011. He has appeared with orchestras in halls ranging from Carnegie Hall and Lincoln Center to Gracie Mansion and The White House.